The holy season of Advent has arrived, and in eager anticipation, we are now on the joyful four-week journey to Christmas. But it is not always easy to be joyful. 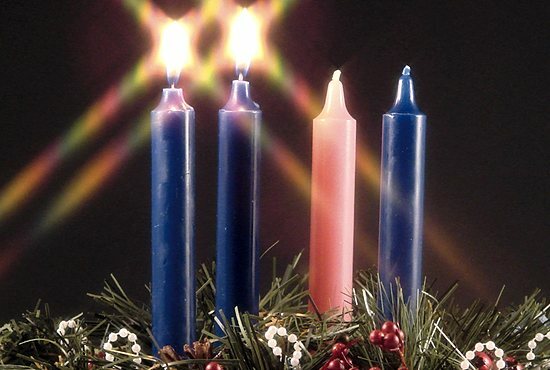 During Advent, the Church pays special attention to the struggle between darkness and light. December is one of the cloudiest months of the year, and the gloomy, gray, dreary, overcast skies can dampen our spirits. Moreover, the days keep getting shorter up to the winter solstice — the shortest day of the year when the light is the least and the darkness is the greatest. The heaviness of the darkness can lead to sadness and feeling down in the dumps. But there are many ways to counteract the bleakness and desolation. Pray. Stay close to Jesus, who is the light of the world (John 8:12; 12:46), the light shining in the darkness (John 1:5). Also, it is a good idea to have an Advent wreath. Each week as the outdoor light diminishes, one additional candle is lit to symbolize how the light of Christ crowds out the darkness, which gives us reason to have exultant spirits and joyful hearts. Another rich source of light is ourselves. Jesus tells us, “You are the light of the world” (Matthew 5:14). When we are kind to one another and do good deeds, such as spending quality time together, being extra patient and complimentary, hosting Christmas parties, or buying and wrapping gifts, our light is set on a lamp stand for all to see (Matthew 5:15), and as our light illumines the house, we spread joy. Christmas decorations are a fun way to increase the light. The sooner the lights are put up, the greater brightening effect they can have. It doesn’t matter whether they are white or assorted colors, they all give off light and cheer the troubled soul. There are so many options: on the tree or a wreath, around windows and doors, on the house or garage, on the lawn or along the driveway. May the light of Christ fill your hearts with gladness as we prepare to celebrate the great feast of Christmas!